When it comes to fruit management, Mom talks about separating the sheep from the goats. The sheep are the good fruit that will last for a while as-is, while the goats are damaged and need to be processed ASAP. What all of this sorting means in the real world is that I had at least half a bushel of "goats" looking for a home Tuesday. Our freezer is getting pretty full of fruit leather, but Mark talked me into filling up the dehydrator one more time, then I opted to can the rest of this batch of peaches. My goal is to have lots of different variations on preserved peaches to pick between this winter, allowing us to select our favorite methods to focus on in later years. My go-to source for basic canning information at the moment is the National Center for Home Food Preservation, but that website nearly steered me wrong this time. 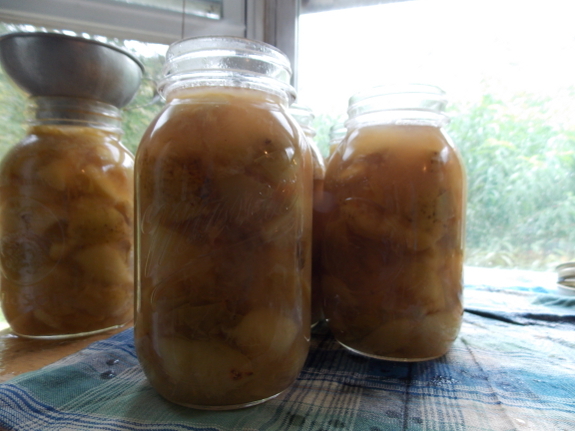 If other sources on the internet are to be believed, white peaches are like tomatoes --- only borderline acidic enough for hot-water-bath canning. So even though the NCHFP website didn't mention this, I added a tablespoonful of lemon juice per quart to ensure my peaches are acidic enough to can outside a pressure canner. Since I was adding lemon juice, I decided to take NCHFP's advice on a different matter and can in a very light syrup of 1-1/4 cups sugar in 10-1/2 cups water, even though I'd been planning to can unsweetened peaches. 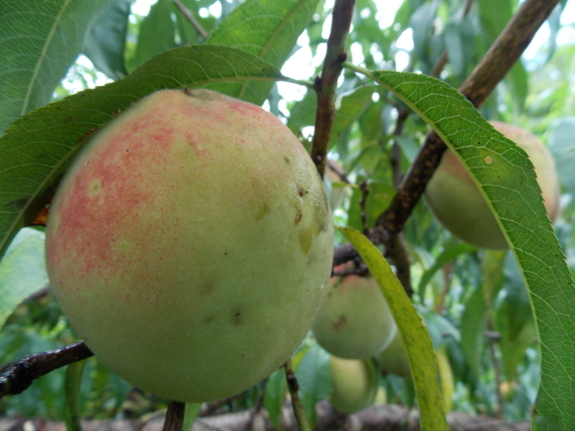 The rest of the peaches on our kitchen tree look like sheep, although I'm sure a few more will develop rot spots and bird bites in the next week or so as they ripen. 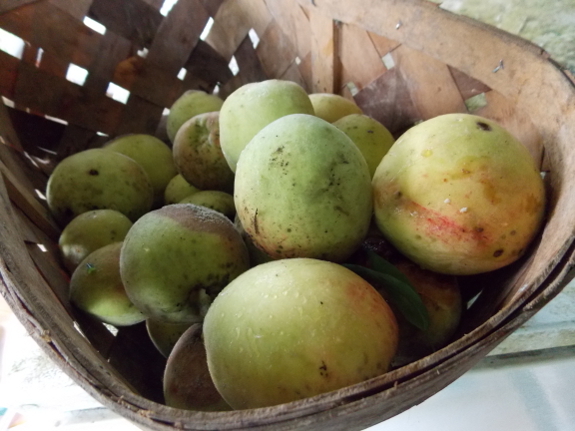 I plan to experiment next with making peach sauce, then with a jam involving pectin, and then Mark will probably talk me into turning the rest of the harvest into fruit leather. That's not counting all the peaches I'll dice up and add to our raspberry-and-blueberry-with-whipped-cream desserts, of course. Our chicken waterer is the POOP-free solution to a filthy homestead problem. The year Uncle Ned died and Joey got stung and fell out of the rafter's of the old barn at Maxie's white peach orchard, you were 1/12 and still nursing! 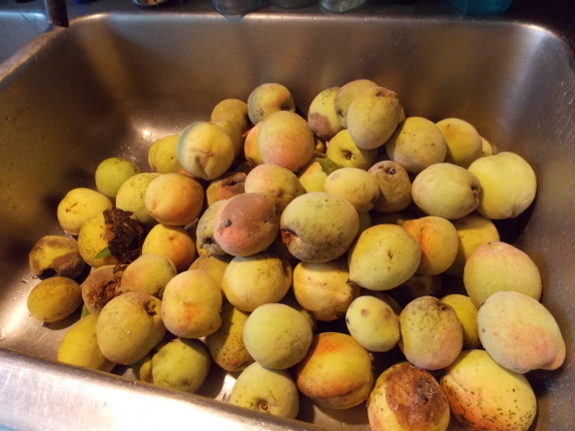 was the year I canned her peaches in a rush--they were small, and I canned them stones, mottled skins and all, which seemed to give them an apricot flavor. No sweetening. Boiling water. I remember lugging down a 5 gal. bucket and hoe--and you. Joey, at 4, was on his own. Have you tried dried peaches? 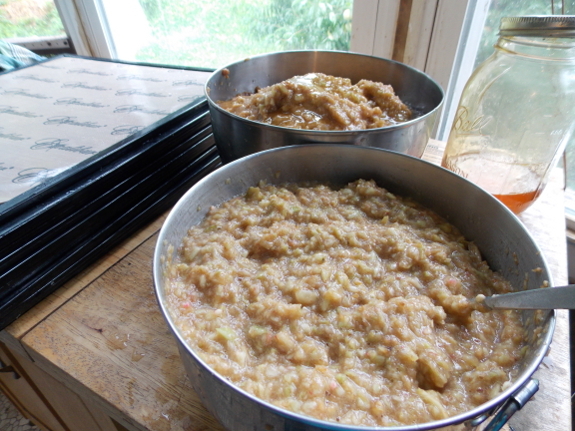 They will sweeten up as they dry. Good on breakfast cereal or to cook with. Mom --- I remembered that story, but not that it was white peaches involved. Thanks for sharing it here! Daddy --- I like dried peaches, but I think I like peach leather better, and it's definitely easier to make.